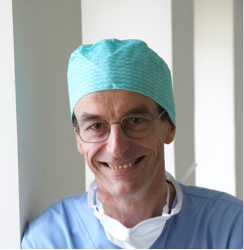 Prof Poelaert is Head of the Department Anesthesiology, University Hospital UZ Brussel (since October, 2007) and Clinical Director of Cardiac Anaesthesia and Postoperative Cardiac Surgical ICU (Sept 30, 2007). He is Board certified Anaesthetist of the Belgian Society of Anaesthesia and Reanimation (August 12, 1988) and he is Board certified Critical Care Physician of the Belgian Society of Intensive Care Medicine (October 23, 1997). He qualified MD, Doctor of Medicine on July 6, 1983 (Faculty of Medicine, University of Gent, Belgium) and specialized in anaesthesia and reanimation (5 years). His PhD thesis was entitled “Transoesophageal Echocardiography in Critically Ill Patients. A Comprehensive Approach”. He is Member of the Editorial Board of the Journal of Cardiothoracic and Vascular Anesthesia since 1993 (Editor in Chief: JA Kaplan, Louisville, KY, US). He is Reviewer and Consultant of Anesthesia and Analgesia ; Anesthesiology ; British Journal of Anaesthesia; Chest; European Journal of Echocardiography; Intensive Care Medicine; Critical Care; Acta Clinica Belgica; and Acta Anaesthesiologica Belgica. He was Visiting Professor from December 1995 – March 1996 in the Klinik und Poliklinik fur Anästhesiologie und operative Intensivmedizin (Prof. Dr H.Van Aken) of the Westphalische Wilhelmsuniversität, Munster, Deutschland. Educational program of transoesophageal echocardiography in the anaesthesia and critical care department and from 20 till 26 February 2005 in the Klinik für Anaesthesiologie und operative Intensivemedizin (Prof. Dr. H. Metzler) of the Uniklinik, Graz, Austria. Educational program of transoesophageal echo-cardiography in the anaesthesia and critical care depart-ment. He was (Co)Promotor of 8 doctoral theses and published 60 Peer Reviewed, 24 Non-Peer Reviewed Publications, and 20 book chapters and he edited 3 books.